Crazy Important Update: Thrive Themes has just made a major announcement – they’re stopping all of their existing themes and combining them into one single super theme – a Visual Theme Builder – that promises to combine the awesome power of their Thrive Architect plugin with a theme. Sounds amazing, but it’s not been released yet. You can still grab access to any of the individual Thrive Themes listed below by becoming a member. You’ll also get every Thrive plugin and theme every made (quite a nunch at this point), including the A/B testing plugin Thrive Optimize and list building tool Thrive Leads. You can get a sneak peak at Thrive’s new theme here. You can read as many sales pages and testimonials as you like, but when it comes to choosing a WordPress theme, there’s nothing quite like seeing it in action on a real, live website. Demo sites are ok, but you only ever see the ‘showhome’ version that’s never been tested by real users. By looking at some real sites that use Thrive Themes, you’ll get to see each theme’s capabilities, run it through a speed test and get some layout ideas. 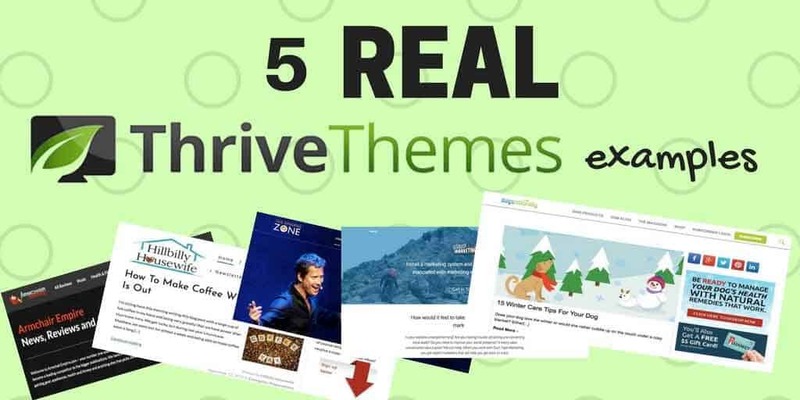 Here are 5 real Thrive Themes website examples I’ve found this year. I’ll include a link to each site so you can experience it for yourself, along with its page load time (Pingdom website speed test), how much traffic it gets (SimilarWeb estimate), the specific theme name, and any relevant additional plugins in use. NOTE: To clarify, the sites I have included all use an actual Thrive theme on their WordPress install, not just the Visual Editor (Thrive Architect) plugin. TheSingingZone.com is a nice example of a Thrive Themes site selling a digital course (the site is run by Per Bristow, a voice and performance coach based in Los Angeles). The site also uses Thrive Architect to create a couple of landing pages for Per’s course and events, and a 2-step opt-in form for email address collection (this comes as one of the theme’s features). 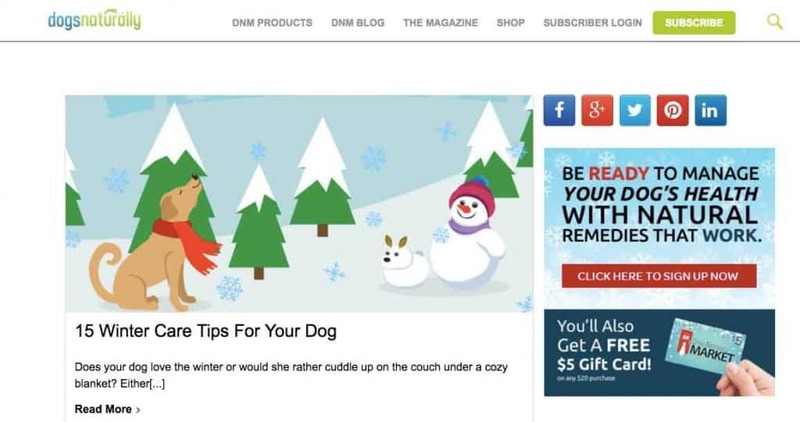 DogsNaturallyMagazine.com is a very successful site built on the Rise theme from Thrive. A portal for everything connected to natural dog health care, the site also uses Thrive Architect to create compelling landing pages, for example this one. HillbillyHousewife.com is a simple, effective homemaking blog built on Thrive Theme’s minimalist “Minus” theme. It’s stripped down and basic, with emphasis on the content, eye-catching sidebar elements (including mailing list sign-up) and a footer advertisement. The theme also provides a useful related posts section, attractive comments and scrolling social share buttons to encourage interaction. I think HillbillyHousewife is the best example I’ve seen of a site built with Thrive Themes and very few additional plugins. ArmchairEmpire.com is an example of the Squared theme in action on an affiliate content website. The homepage has been customized with Thrive Architect to provide simple links to review categories and a blog grid. The site also makes use of the WP Review Pro plugin to create attractive product reviews. 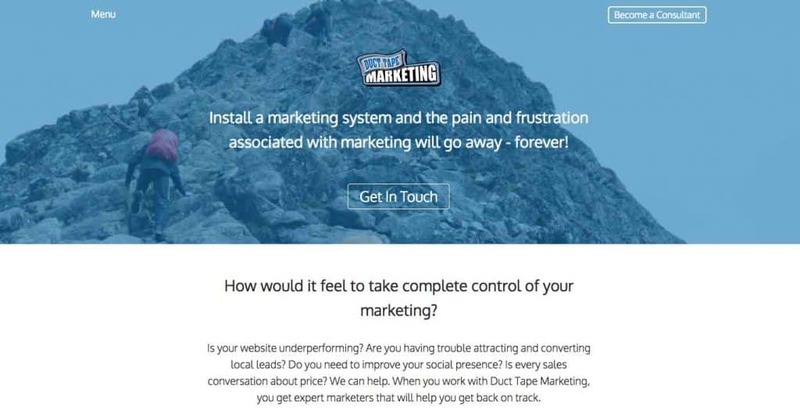 DuctTapeMarketing.com is an excellent example of a well-designed agency website, built using Thrive’s Squared theme. The site is run by marketing consultant John Jantsch and doesn’t diverge much from Squared’s demo framework (view the demo here), which is great because it’s a very nice-looking, functional, fast website. The site also uses Thrive Architect to design attractive pages for the site’s podcast episodes (for example, this one). Thrive Themes: is it worth it? There are some big names in the WordPress theme game, but Thrive Themes have gained an almost cult following in the last 3 years or so, and it’s no surprise as to why; the themes look good, perform well and are extremely easy to setup and customize (with color pickers and page templates etc).I’m not going to lie, I personally choose to use the Genesis Framework (from StudioPress) for this site, mostly because I installed it years ago and am too lazy (and cheap) to change it… however, with a cheaper license (currently $49 for single-site use, $67 for unlimited ) than Genesis and a large community of users and official support, I would definitely recommend a Thrive theme (and in particular, the Rise theme) to anyone starting a new WordPress website today. I hope these 5 examples of actual, real, working WordPress sites that currently use a Thrive Theme are useful in helping you make a decision about which theme to use on your site. If you want to ask me anything specific, drop me a Tweet (@tomtheseoguy) or leave a comment below. P.S Some of the landing pages created on the above sites were made using Thrive Architect (formerly Thrive Content Builder/Thrive Landing Pages), for more details, read my full review here (I use Thrive Architect as a plugin alongside my Genesis theme). UPDATE: here are some examples of the Thrive Architect plugin in action. And keep an eye out for the new super Thrive Theme (think “one theme to rule them all”!) launching later in 2018.